“Haluan nähdä muutakin” (I want to see something else) was a project conquering a little part of the commercial outdoor media back to the people. 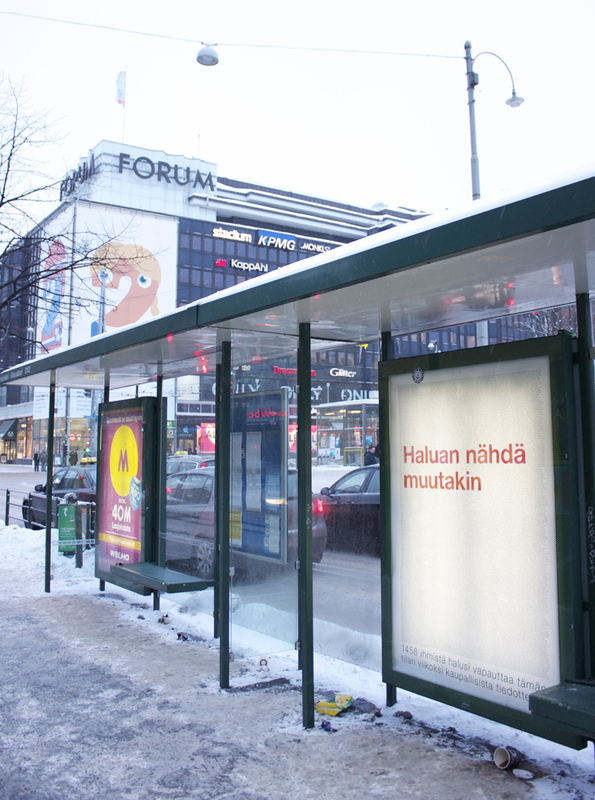 For one week, 21 bus and tram stops in downtown Helsinki were bearing a non-commercial message. 1458 people participated in renting them for one week – at 5896.62 euros, the average contribution was 4.20€ per person. The word was spread through a Facebook page from the beginning of December. Within 1.5 months, the page reached almost 6000 fans and it took only two weeks to collect the needed amount of money. The text in the posters said in Finnish: “I want to see something else – 1458 people wanted to free this space from commercial purposes for a week”. In addition, the poster displayed 1311 messages from the participants – telling what they would like to see instead in urban space. The “bus/tram stop exhibition” took place 24–30 January 2011. The project was created by Elissa Eriksson and it is part of her MA final theses in the Aalto University School of Art and Design. For more information contact Elissa: firstname.lastname@gmail.com.